While culinary art classes focus primarily on the details of the art, teaching students about nutrition, seasoning, and knife handling, it is still important that students be exposed to equipment they will find in a commercial kitchen. HGTC is one school that is upping the ante on their student’s resources by building a new culinary art facility this year. The new building should bring students in contact with new equipment, bigger spaces, and more interactive learning possibilities. MYRTLE BEACH, SC (WMBF) – Horry Georgetown Technical College will have a brand new building for their culinary arts program in the near future. In about 6 months, HGTC plans on breaking ground on the state of the art facility and revamp its program, giving students the most up to date knowledge and technology. Department chair for the culinary department Tom Mullally said in 2 to 3 years, students will be able to perfect their craft in the new building. “We’re really looking forward to it. It will actually be state of the art everything. There is going to be a wine cellar in the building. There is going to be a greenhouse in the building,” said Mullally. Mullally explained that at the present time, students attend both the Grand Strand and Conway campuses. 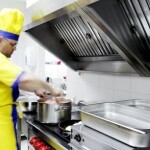 Culinary art school kitchens vary in size and in the type of equipment that may be available to students. To get the most out of the culinary school experience, it is important for students to ask questions about the types of equipment that are available for use in a given program. While not all schools are lucky enough to have a brand-new state-of-the-art kitchen like the culinary art school in the story above, most have equipment that students will use once they enter the career field.